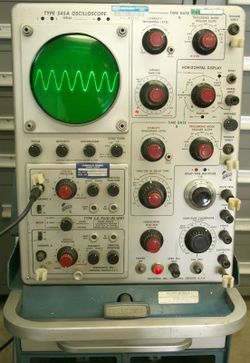 The Tektronix Type 545 is a 30 (33) MHz scope that takes letter-series and 1-series plug-ins. It has two timebases, which allows delayed triggering. Type 545 was introduced February 7th, 1955 along with the Type 541, and superseded in 1959 by the Type 545A, which was in turn superseded in 1964 by the Type 545B, which was produced until 1973. The difference between the 545A and 545 is the control ergonomics, not any major circuit design changes. However, the delaying timebase on the 545A supports delays up to 10 seconds while the 545 supports delays only up to 100 milliseconds. The older 545 uses the T54 / 5BHP2 CRT, P2 phosphor was standard. The 545A uses the T5430 CRT for which also P2 phosphor was standard. The newer 545B came with the further improved T5470 CRT (also used in the 543B, 544, 546 and 547) and P31 phosphor as standard. There were also rack-mount versions. Types RM41 and RM45 were introduced in October 1957, Types RM41A and RM45A were introduced in May 1959 simultaneously with their bench counterparts, and the rackmount Type RM545B or R545B was introduced at the same time as Type 545B. Clones of the 545A are the Lavoie LA-265A and Hickok 1805A. These clones were not licensed by Tektronix. The Type 53K/54K plug-in was introduced with the 545 and 541, and until Type 53/54L came out in 1957, it was the only plug-in that could take full advantage of their bandwidth. There was never a full-speed dual-trace plug-in — that would wait until Types 1A1 and 1A2, which came out with the 545B. Early 545 units have selenium rectifiers. Later units have silicon rectifiers. The trigger circuit used a 6DJ8 tube in the 545 and 545A. NPN transistors are used in the 545B trigger circuit. Types 545 and 545A have a six stage differential distributed vertical amplifier made of twelve 6DK6 tubes. The vertical amplifier used in the 545A is also used in the 551 and 555. The 545 uses the 154-098 CRT. With the limited CRT technology available at the time, the higher bandwidth of the 541 and 545 came with a tradeoff. The vertical scale is only 4 divisions, 2 above and 2 below the graticule center line. The lower bandwidth 531 and 535 retained the 6 vertical divisions, as used in most other Tektronix scopes. In the 545, the distributed vertical amplifier's plate supply was not separately fused. Shorting the outputs of the vertical amplifier to ground can cause major damage. In the 545A, there is a 150 mA fuse, F1054, preventing such damage. The Type 545B differs significantly from the 545 and 545A. It has a partly solid-state, non-distributed vertical amp, and uses the 154-0478-00 CRT which is also used in the 544, 546, and 547. Improvements in CRT design, including reduced deflection plate capacitance and increased sensitivity increased the vertical scale in the 545B from 4 to 6 divisions. The improved CRT also uses a ceramic envelope, with flat glass faceplate that has internal graticule markings, eliminating parallax errors. Just wanted to add an alternative supplier for replacement fan mounts for the Tektronix 545 oscilloscope fan. Digi-Key currently stocks two part numbers which fit and work perfectly: RPC1597-ND and EAR1345-ND. Both are 1/2" length (same as original) and both have 8-32 male threaded ends (same as original). Both are slightly smaller in diameter (0.4" vs. the 0.5" originals) but this does not affect their fit at all and likely does not affect their function appreciably. I have installed three of the RPC1597-ND standoffs in my 545 and they fit and work perfectly. This page was last edited on 25 November 2018, at 14:46.